As I often do when I really love a book, I've let Station Eleven linger with me ever since I finished it. I wish I was the kind of reader who immediately shouted my love for my favorite books, but I tend to love them quietly at first. I've written about it before - the way I want to keep my favorite books a secret. But, at the same time, I want other readers to discover the book that's just captured my heart! So, just know before you read anything else that this is that kind of book I almost want to keep all to myself. Honestly, I never would have picked up Station Eleven based on the summary. Literary science fiction? I'll pass. And yet... Station Eleven was a BEA Adult Buzz Book, which is really the only reason I wanted to read it. I attended a panel with the authors of all the books chosen this year, and I became intrigued as I heard Mandel describe her book. When I got home, it ended up being one of the few books I was most anxious to read. So, I stuck it in my suitcase as I headed off to the beach in July. And the rest, as they say, is history. Station Eleven opens with the death of a famous Hollywood actor in the middle of a performance of King Lear. In a few hours, the world is on the brink of collapse as a global flu pandemic wreaks havoc on the population and forever changes the world as we know it. The novel follows five people and moves back and forth through time - from the early day of the actor's career to fifteen years in the future (after his death), focusing on a theater troupe known as the Traveling Symphony as they wander the wasteland that remains. Although it sounds complicated or maybe even a bit strange, it was such a fluid and remarkable reading experience for me. Personally, I think it's better if you go into Station Eleven without knowing too many details about what you'll find inside. There is much thought that goes into every single thread in this story! It's a quiet story, and there isn't a lot of action (which may be surprising if that's what you associate with the end of the world). Reading it felt otherworldly and yet so familiar - a haunting and unforgettable picture of before, during and after the collapse of civilization. I thought the writing was absolutely stunning. Mandel weaves all of these voices together into a moving story that stayed with me for weeks after I finished it. The characters were all complex, well-developed and realistic. I loved discovering their connectedness and watching the pieces of the story intertwine. And I loved seeing them all interact with the setting. Above all else, Station Eleven is a book focused squarely on its characters. The world is there - haunting and terrifying - but it's the characters who absolutely won me over. While some might find it slow, I thought the pace added the perfect amount of tension. The pace makes the book feel more contemplative, which gave me time to really ponder all that was happening and the meaning behind every moment. And those moments are laid out brilliantly in Station Eleven's pages. I don't always love flashbacks, but I loved that Mandel didn't follow a linear timeline. I wasn't sure of it at first, but I ultimately appreciated the book even more because of it. In a way, it reminded me that writing is a craft and there is so much intent in the way an author tells a story. When she spoke at BEA, Mandel talked about the power and value of art, the role of technology, and the exploration of relationships between people. Station Eleven has managed to capture all of that and more. It focuses on people and how they relate to the world, to each other and to art. And in all that chaos, there's hope, beauty, the desire to belong and longing to be known. This is just one of those books where everything fell into place and worked perfectly for me: the writing, the setting, the characters, the pace, the themes... all of it! The last time I really felt this "wowed" by a book was when I read Burial Rites by Hannah Kent last year. I've loved many books since then, but not with the same sense of awe that I felt reading this one. My pre-order arrived this week, and I foresee a future where I savor this book again and again! Although it won't work for every reader, I will heartily and happily recommend Station Eleven to anyone looking to try something new. It was smart and moving without being pretentious or too "literary" for me to fall in love the story and its characters. It paints a gorgeous, evocative picture of people once everything has been stripped away. Almost two months have passed since I finished it, and I've read numerous books since then, but I can still clearly picture so many scenes in my mind. Quite simply, Station Eleven has stayed with me. "Hell is the absence of the people you long for." Reading the synopsis I was like...huh? BUT how you describe it as smart and moving and sticking with you - Yes. Yes I do need this in my life. Okay you just compared this to Burial Rites, so SOLD. I was already watching this one. But, yep. Oh my gosh, this sounds awesome, do I want to read this? It sounds fucked up and crazy, my cup of tea. oh wow this sounds like a GORGEOUS BOOK! just put it on hold at my library. 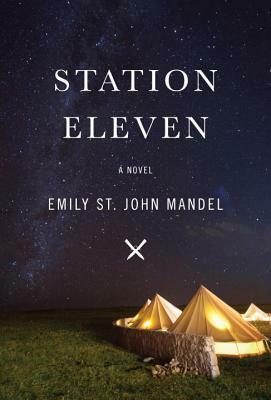 Honestly, I'd not heard of Station Eleven until you started to mention it a little on Twitter! And now, of course, as I read your lovely review. You've seriously managed to make this book sound like such an incredible, evocative reading experience - and one that I want to be immersed in like you were. Also, I love that you take your time savoring the books you love. It's something I truly admire - and actually, I feel very much the same way.